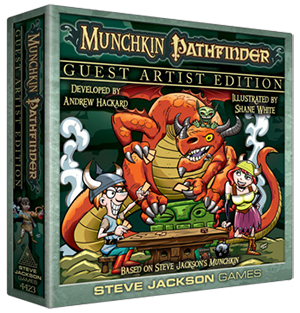 Daily Illuminator: Munchkin Pathfinder Guest Artist Edition Coming To A Store Near You! November 7, 2016: Munchkin Pathfinder Guest Artist Edition Coming To A Store Near You! Munchkin Pathfinder Guest Artist Edition gives players all the pathfinding and munchkining of the original Munchkin Pathfinder, with illustrations from Shane White, artist for the Pathfinder: Goblins! comic. And it will be at your local game store soon! Classic Pathfinder classes like Alchemist and Witch, along with weapons like the T-Bone Stake, are reimagined in Shane's dynamic art style. (And you'll need the best weapons to defeat the hordes of goblins, and stronger enemies like Lamashtu, the Mother of Monsters.) His experience in the Pathfinder universe shows, and gives Spyke and Flower a whole new look. For more insider info, check out our previous interview with Shane White, as well as the art-comparison post. Then, book it to your friendly local game store and preorder a copy of this guest-artist illustrated, dragon-slaying, limited-edition game!